Many of the now popular vintage Knee Huger Elf’s were made by Napco,and Yuletide Company of Japan throughout the 1950s and 1960s. 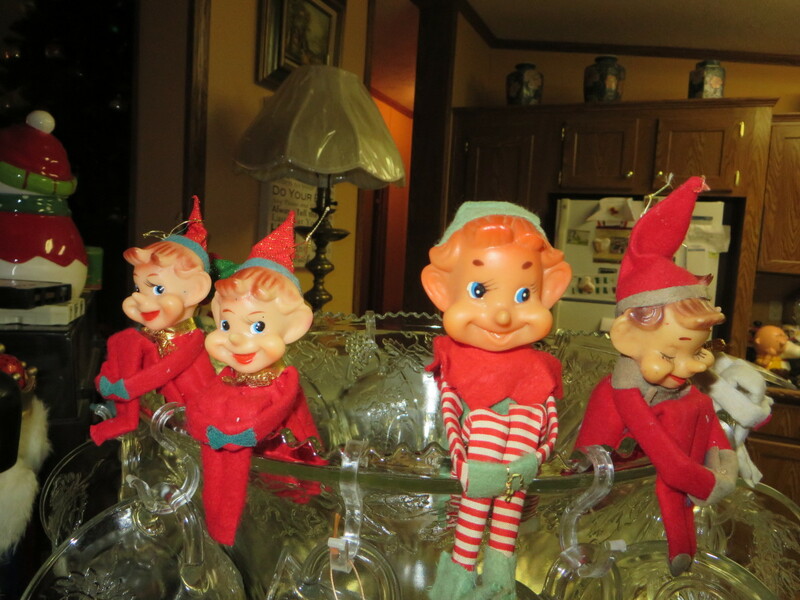 They did an excellent job with their Elf’s and became very popular in the United States and Canada during this era. The Yuletide Company of Japan was one of those amazing companies that were part of the rebuilding of Japan peace time manufacturing after World War II. Companies like Napco, Yuletied and Dakin with the help of the United States government during the occupied period were able to retool and build new peace time manufacturing centers in Japan. The new Christmas holiday based Japanese factories that manufacturing of toys and novelties such as Napco, Yuletide and Dakin were part of restoration of Japans economy during this era. 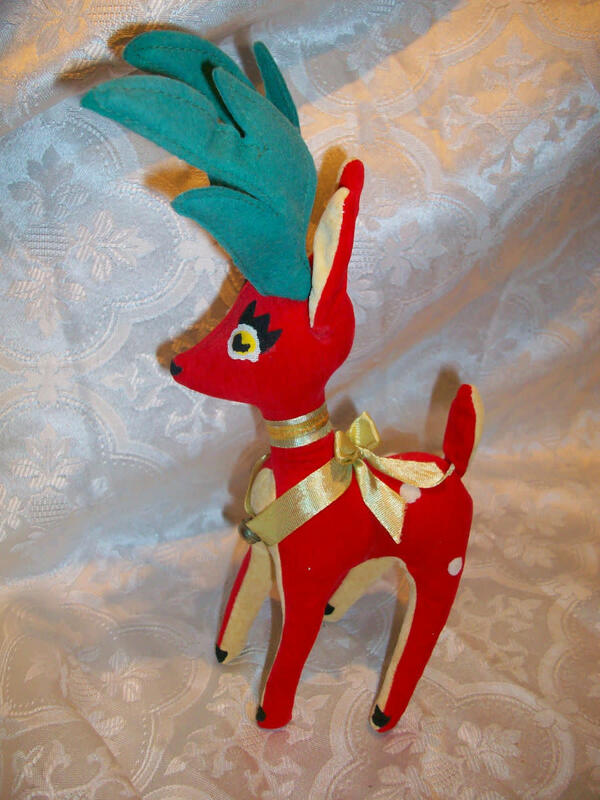 By the 1950s Knee Huger Elf’s, Santa’s, and Dakin Dream Pets and Christmas Reindeer had become very popular in the United States, to the holiday consumers, these Japanese holiday toys, and decoration novelties were the rage, and the must have items of Christmas displays. The knee-huger elves and Dream Pet Christmas Reindeer's are part of the American Christmas culture now. These adorable little decorations made in Japan took the western sense holiday of magic to a whole new level. The adaptation of Christmas holiday culture of the United States was taken by Napco, Yuletied and Dakin to a whole new level of for mass consumption. These sweet Elf’s and Deer’s with their innocent expressions help bring about a pleasant peaceful feeling in the decorations of the holiday home. The Japanese sense of cuteness and innocents was homed to a whole new level in these remarkable novelties for the holidays. These Elf’s and Dream Pets are an example of the parallel aesthetic cultures have be they western or eastern. The knee-huger elves and Dream Pet Christmas Reindeer's are part of the American Christmas culture now. 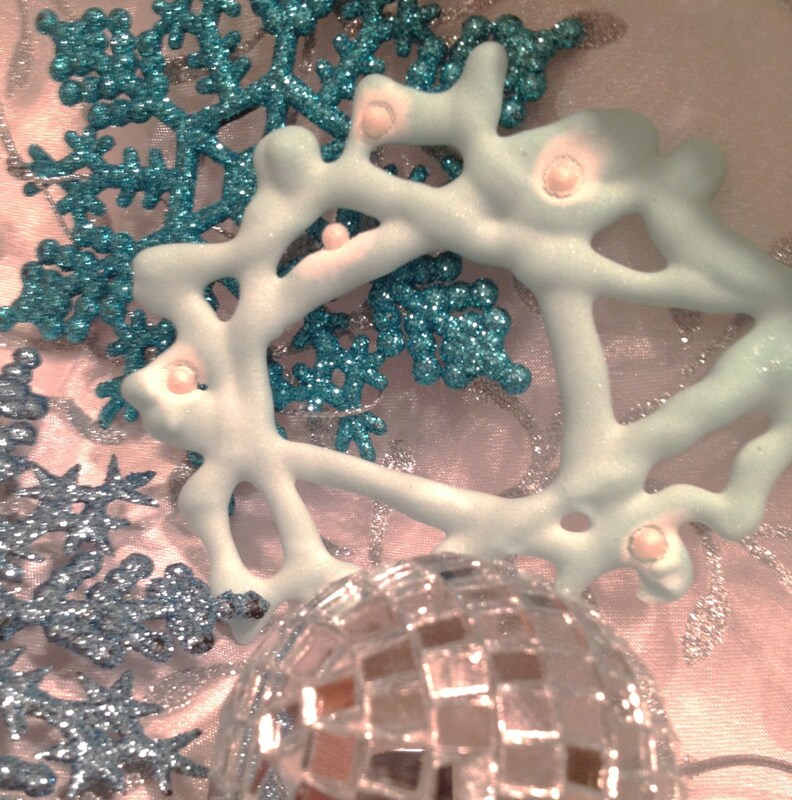 These adorable little decorations made in Japan took the western sense holiday magic to a whole new level. Dream Pet Deer’s and Knee Huger Elf's were manufactured in Japan at a time when “Made in Japan” meant holiday magic and fun times for children of all ages. 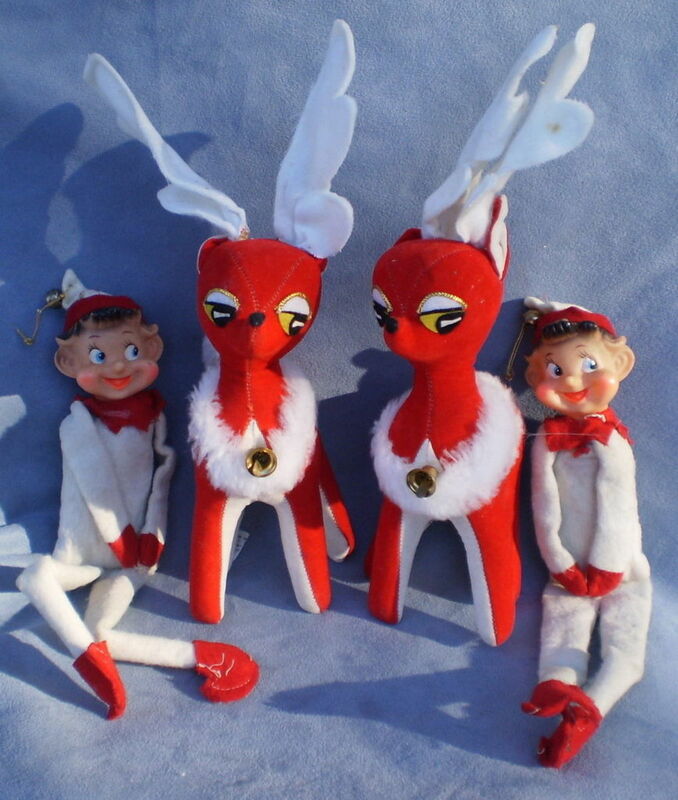 The knee-huger elves got their remarkable cute name from their flexible and soft bodies, which were remarkable well made with hidden wires wrapped in colorful holiday fabrics such as felt and/or gold and silver metallic clothe fabric. They were truly knee hugers because their bendable arms could hug their bendable knees. So you could pose them under the tree sitting or set them on shelves or coffee tables, or even hang them on the Christmas tree as ornaments. So that they could either sit on shelves or be hung as Christmas ornaments. The role of the Knee-huger Elves is that of Santa Claus Helpers. The Dream Pets Reindeer's came out in the 1950s and are holiday collectibles stuffed animals, they are made of velveteen and sometimes gold and silver clothe. The Dream Pets reindeer’s are filled with sawdust from Willow trees. 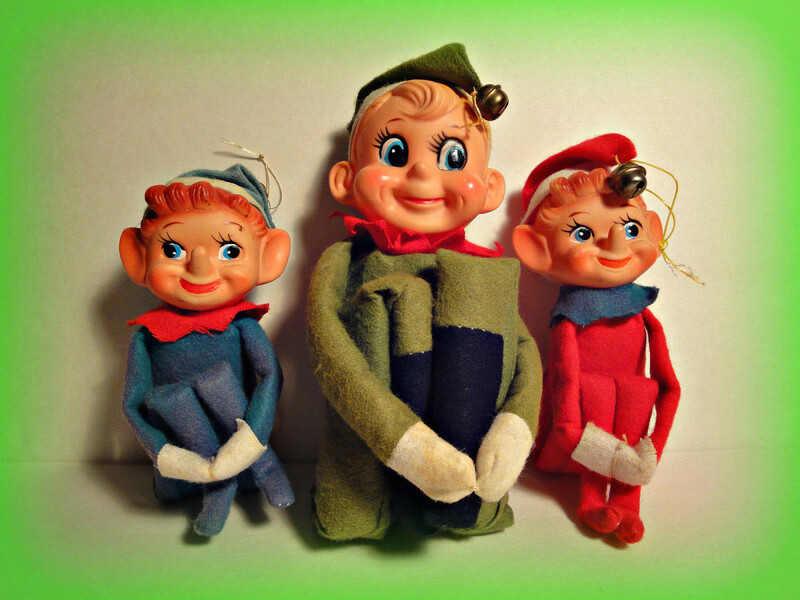 The Knee-huger elves had adorable well designed heads that were made from plastic injection-molded forms. Their skin tone was pale with brightly colored cheeks all rosy, and bright eyes with a happy look about them. The hair color on most of these pixies was blond, red, black, or brown. Their bright eyes were often blue, green or brown with large soulful black irises, and they usually had three lines of long playful eyelashes. With upturned noses that went good with their full and rosy pink cheeks. 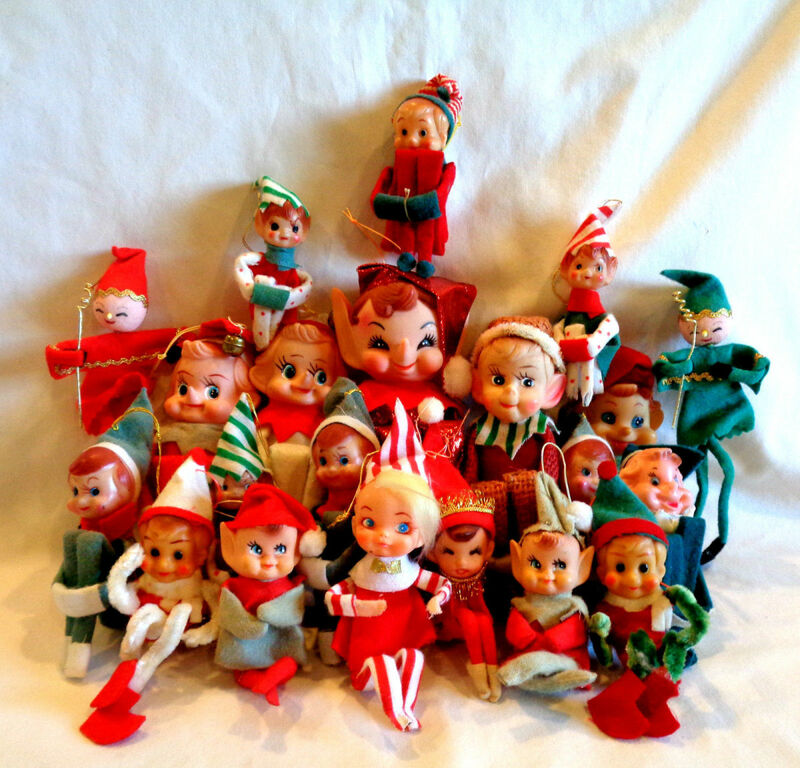 Many of the now popular vintage Knee Huger Elf’s were made by Napco,and Yuletide Company of Japan throughout the 1950s and 1960s. 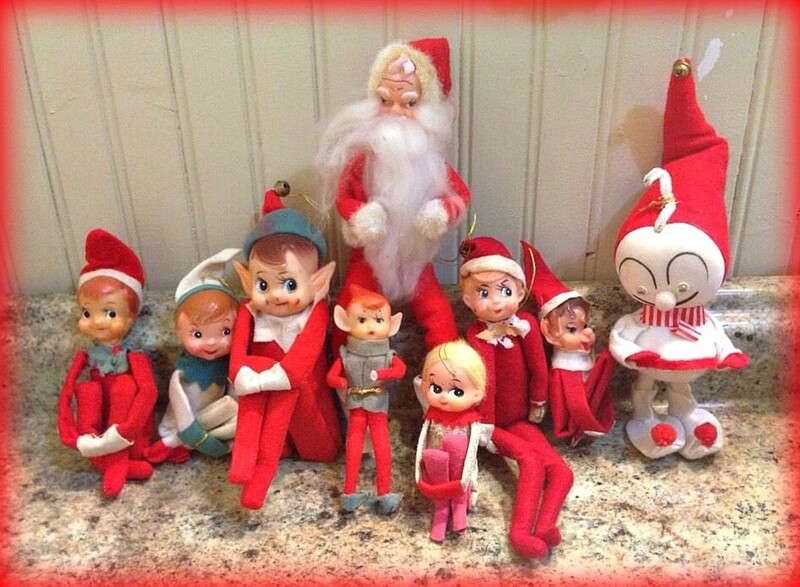 They did an excellent job with their Elf’s and became very popular in the United States and Canada during this era. The Dakin Dream Pets, Christmas Reindeer, and Knee-huger Elf's are made by the Japanese with great understand of what is cute and adorable. With the warm nostalgia expressed by most adults that grew up in the 1950s and 1960s their popularity is directly related to the holiday memories of these folk’s during their childhood. Because Dream Pets and Knee huger Elf’s trigger happy remembrance of a more secure world of long ago. They are emblematic of a wonderful peaceful and magical time in the past that only they can bring back every Christmas for future generations to enjoy. 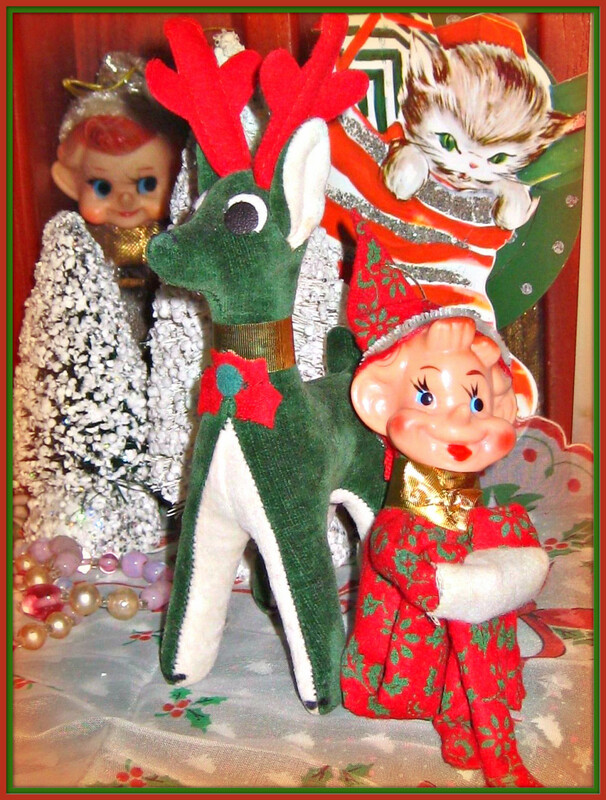 Dream Pets Reindeer's & Knee-huger elves are Treasured Today. The amazing thing about Dream Pets Reindeer's and Knee-huger elves are that these Christmas novelty decorations and toys are so sought after and treasured today. The fact that they were mass-produced in Occupied Japan after World War II, and during the 1950-1960s makes them very vintage holiday treasures today. It does not take much effort to see their amazing and remarkable popularity online, they represent a cherished aspect of the 1950s and 1960s Christmas experience in American. 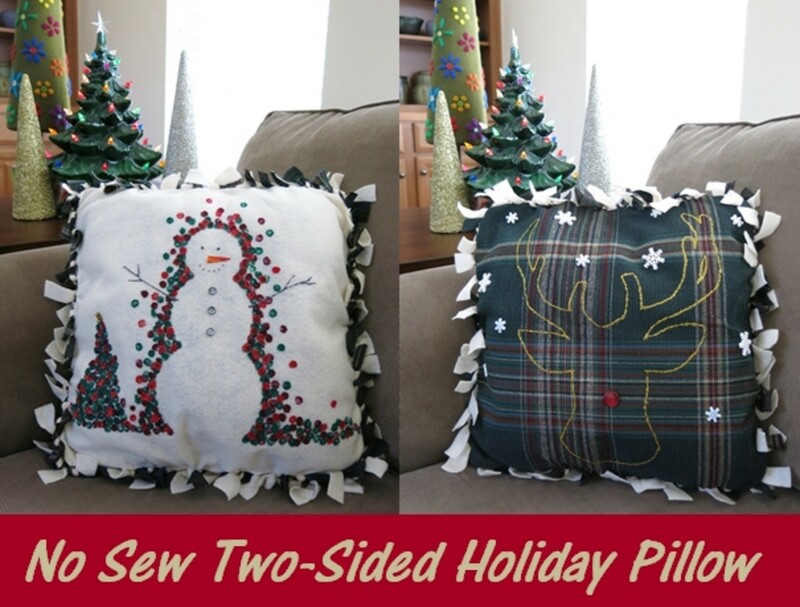 Knee Huggers could Sit on Shelves or be hung as Ornaments. 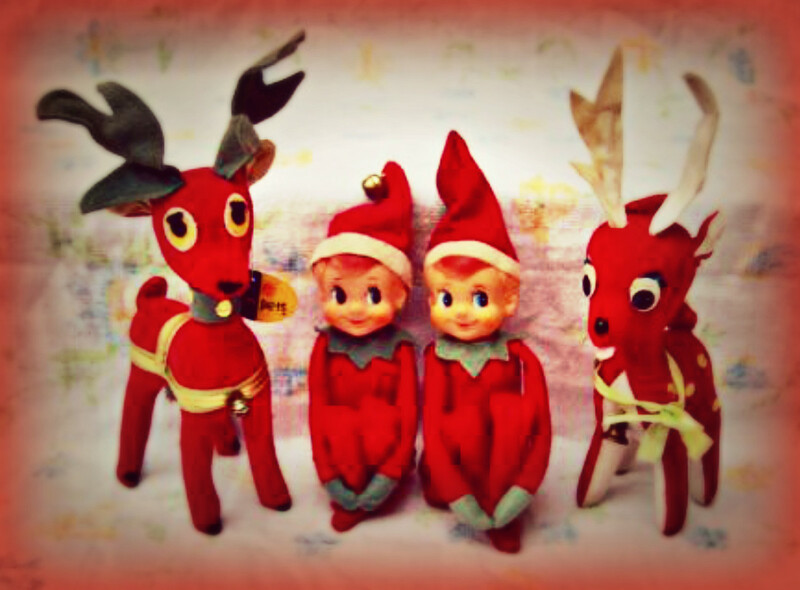 By the 1950s Knee Huger Elf’s, Santa’s, and Dakin Dream Pets and Christmas Reindeer had become very popular in the United States, to the holiday consumers. Some people think that today the Knee-huger Elves are popular due to the success of a book titled the Elf on the Shelf, which was written in. But if feel the values of these Elf’s and Reindeer’s is more about people trying to connect to a happier time in their lives. 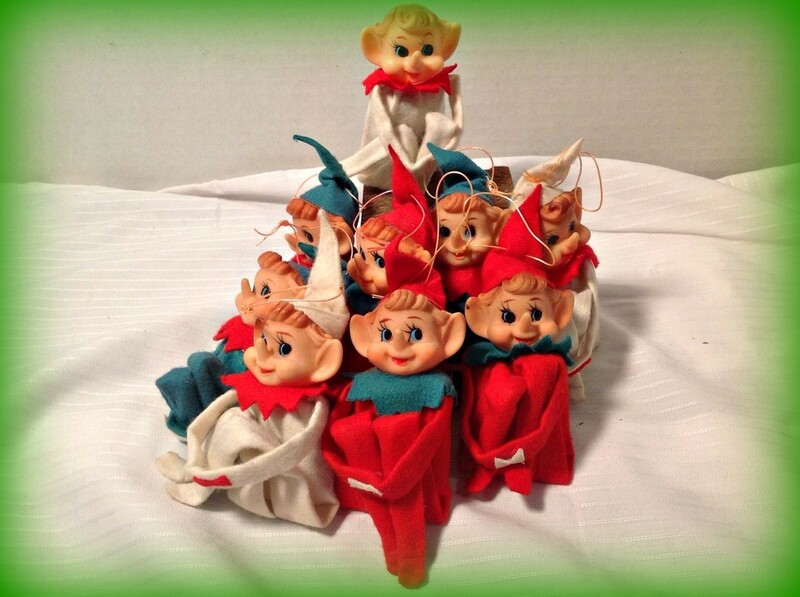 Back in the 1950s and 1960s many children had an Elf knee huger ornament for the Christmas tree it was part of a experience that they wish to pass on to future generations. The first reindeer’s were manufactured in Japan beginning in the year 1957 by remarkable Japanese toy designers whose name was Tochigi Mongi. The Dream Pets Reindeer's came out in the 1950s and are holiday collectibles stuffed animals, they are made of velveteen and sometimes gold and silver clothe. The Dream Pets reindeer’s are filled with sawdust from Willow trees. The first reindeer’s were manufactured in Japan beginning in the year 1957 by remarkable Japanese toy designers whose name was Tochigi Mongi. 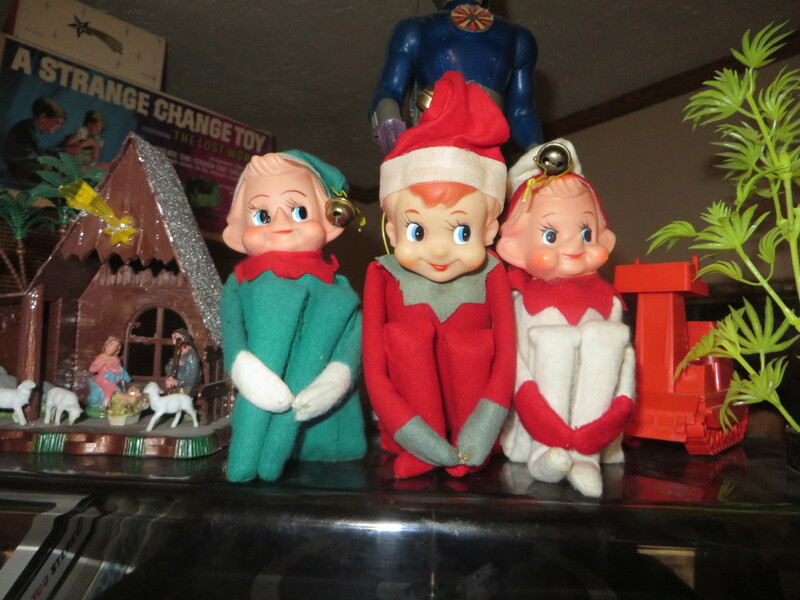 It is fun to mix and match the Knee Hugger Elf's with other Christmas figure from the same era. Makes for great photos and center pieces for a holiday table. Knee Huggers need to move around each Christmas Holiday. 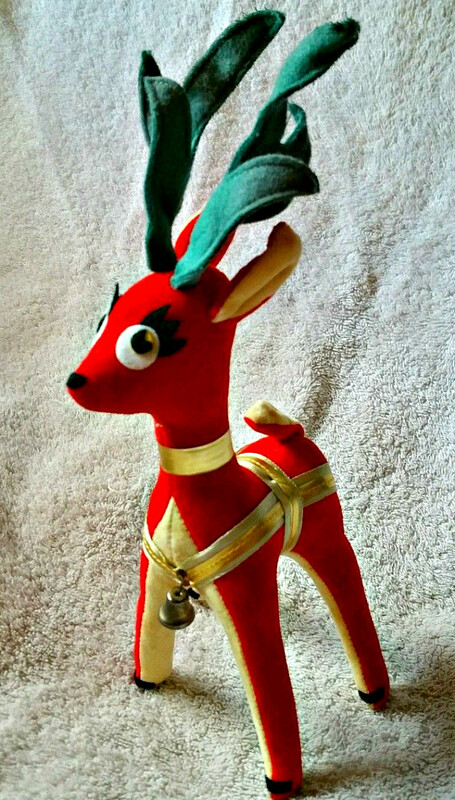 These Knee Huggers and Dream Pets Reindeer are not only toys but prized ornaments. I have seen many great collections of Elf’s, and I know how dear my own Dream Pet and Knee Hugger collection is to me. The amazing thing is that all Christmas memories are so special to each person. I have never put an Elf on wreath as a permanent fixture. To me they need to move around each Holiday. Looks like these three Knee Huggers are up to Something. Looks like these three Knee Huggers are wanting to tell us something. I wonder what they have be up to. Probably more mischievous deed and pranks. The remarkable Dream Pets holiday reindeer’s rapidly caught on as a great center pieces for coffee tables and dinner tables in the 1950s and 1960s. So the holiday Dream Pets became their own holiday decoration toy line inside the Dakin Company. Dakin, back in the 1950s was perhaps better known for the manufacturing of guns. But once the Dream Pets reindeer’s had a remarkable holiday season they decided to manufacture the Dream Pets year round, and they even keeping the awesome name the factory workers had given them. 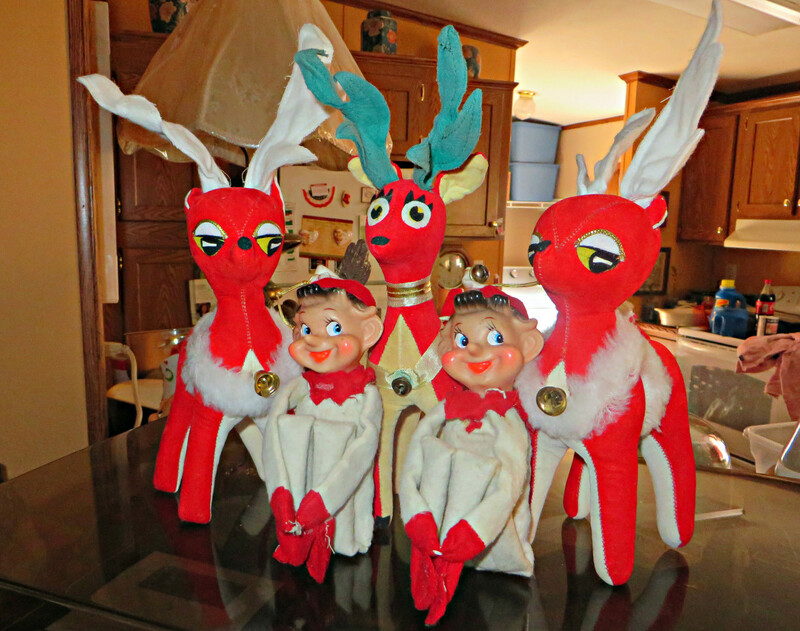 The remarkable Dream Pets holiday reindeer’s rapidly caught on as a great center pieces for coffee tables and dinner tables in the 1950s and 1960s. So the holiday Dream Pets became their own holiday decoration toy line inside the Dakin Company. These Knee Huggers and Dream Pets Reindeer are not only toys but prized ornaments. I have seen many great collections of Elf’s, and I know how dear my own Dream Pet and Knee Hugger collection is to me. 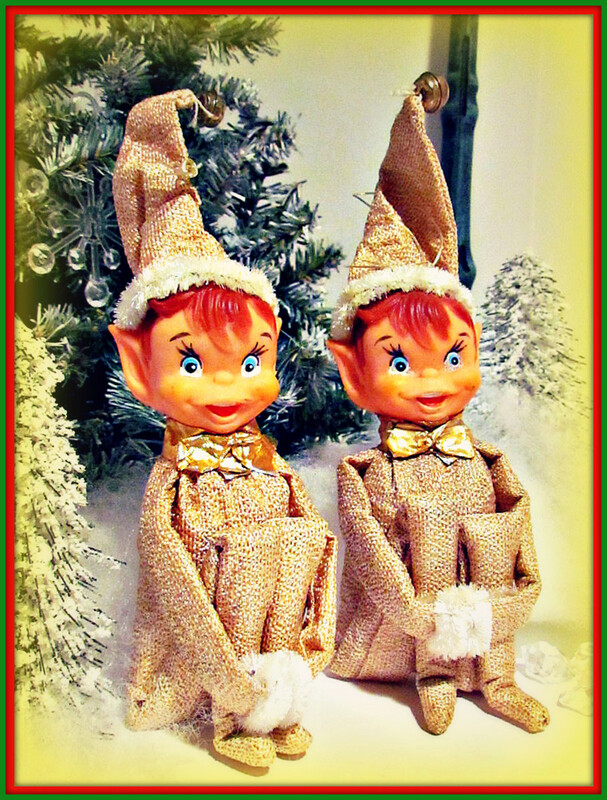 Twin Knee Hugger Elf's, Chip and Dip in their Metallic Gold suits are ready for some Christmas cheer. Japan is the Nation that made Knee Hugger Elf's and Dream Pets. 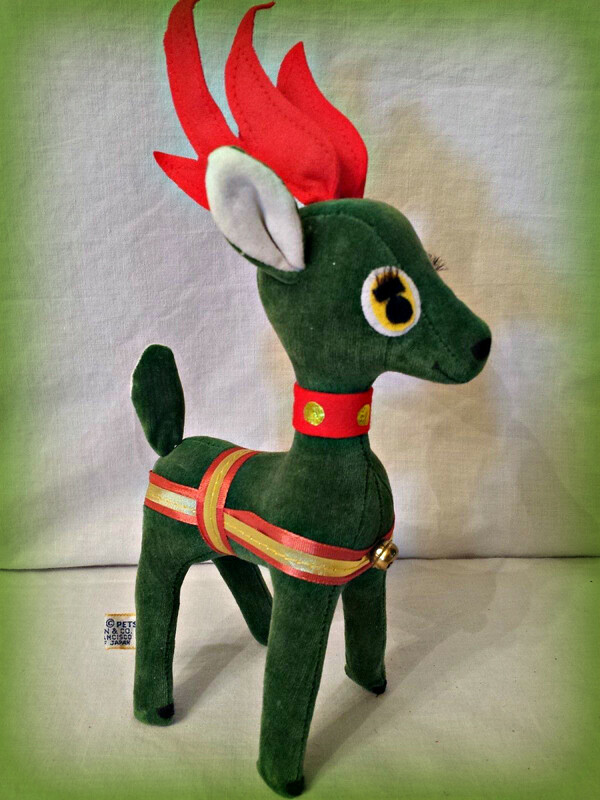 A green velveteen Dream Pet number 424 reindeer with the name little Prancer. Prancer was issued in the fall of 1964. He has red antlers which are wired, ears have white inserts as does the tail, and the underbelly is also white velveteen. Prancer has a gold band collar. His side kick is a fancy red felt knee hugger with gold ribbon collar, the little pixie has white felt mitten – muff and pipe-cleaner hat trim. With his well groom molded tuft of hair, and hand painted expressive face he is ready to party. He has chubby cherry cheeks, and a great Elf smile. Analysis of Women in "The History Boys"
I LOVED this article. So into retro. Sharing to Tumblr!